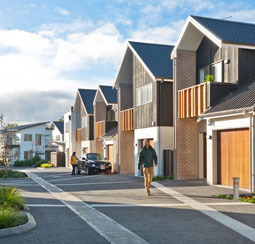 Hobsonville Point is a masterplanned community of 3,000 homes, schools and a full range of the services and amenities. Buckley Ave was the historic entrance to the airbase, and is an important connection between the past and futre as a new town. 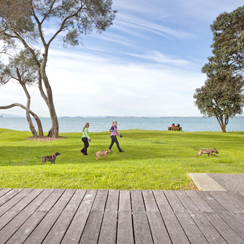 Hobsonville lies on a peninsula of land extending in to the Upper Waitemata Harbour and is located approximately 11km north-west of Auckland central. 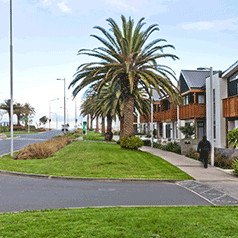 Buckley Ave is a key street in Hobsonville Point, and runs through the area formerly used as the Hobsonville Airbase. Following the decision to dis-establish the airbase this land was subject to a masterplan process to allow the development of a new Auckland suburb, with new housing, schools, businesses and open spaces being constructed. The overall site is 167ha and has been broken up into large precincts for which “Comprehensive Development Plans” (CDP) were prepared to guide their development. Buckley Ave gives its name to the Buckley Hobsonville CDP which covers a significant portion of the overall development area. 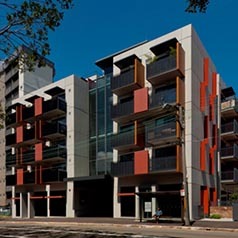 This area of the peninsula has been recently developed as the first part of the neighbourhood. Buckley Ave continues in to the “Sunderland” precinct which will be developed over the coming years. Buckley Ave is an important street in this masterplan. It is not the main vehicle route through the site, so has been designed with its function as a key pedestrian route in mind, and it’s wide corridor will serve as a community space for informal recreation, while connecting several community hubs. The street was designed in conjunction with the land uses that will run along it, to ensure that these are complementary to each other.